Under the High Authority of HEM Alassane OUATTARA, President of the Republic of Côte d’IVoire, the Governement is commited to an ambitious recovery and economic and social development program to make Côte d’Ivoire an emerging country by 2020. In this context, the Governement has made the fight against malnutrition a national priority as part of the National Development Plan (2016-2020 NPD). Indeed, malnutrition, a real public health problem in the country, is characterized both by the persistence of under nutrition and the accentuation of over nutrition. The analysis of the nutritional situation has shown that the prevalence of stunting has gone from 34% in 2006 to 29, 8% in 2012. This rate is much above the acceptable 20% one prescribed by the WHO. Furthermore, the prevalence of national acute malnutrition or emaciation is around 7% in 2012. Underweight children under five that is of 14, 9% in 2012 is remains high in comparison to the acceptable 10% threshold. Additionally, the prevalence of anaemia has been estimated in 2012 at 75% among children under 5, at 54% among women of childbearing age and at 30% among men aged 15 to 49. Furthermore, 25, 6% of women of reproductive age are overweight. Malnutrition, because of the negative effects it has on human capital development and on work productivity, imposes significant socio-economic cost to the individuals, the community and the state. To show its commitment, the Government acceded in June 2013 to the global Scaling-Up Nutrition (SUN) movement. 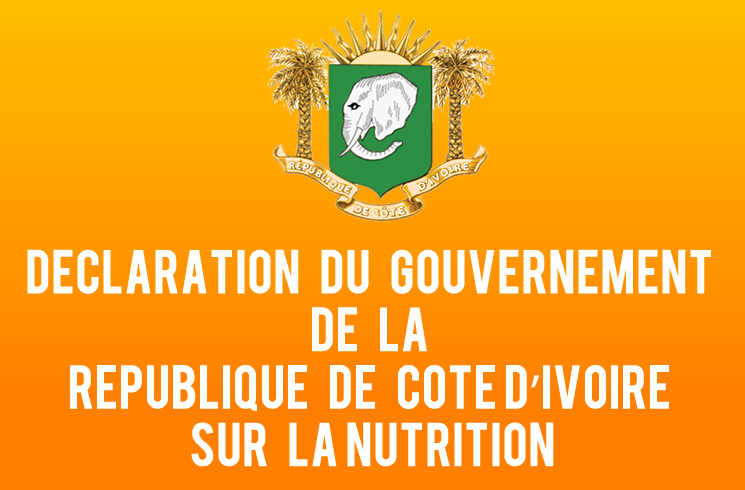 This commitment is reflected by: (i) the establishment in July 2014 of the National Nutrition Committee (NNC), a multisectoral coordination platform for an effective and efficient management and programming of the actions in favour of nutrition; (ii) the elaboration of the 2016-2020 National and Multisectoral Nutrition Plan and the harmonization of sectoral policies in that matter; (iii) the inclusion of the investments dedicated to nutrition as regard to the priorities of the Public Investment Program (PIP) and; (iv) the significant increase of the nutrition dedicated budget. In line with the 2016-2020 NDP, the Government has approved on 11 May 2016, the 2016-2020 National and Multisectoral Nutrition Plan (NMNP). The Government aims with this plan to “ensure the whole of the population, an optimal nutrition status to enhance its well- being and secure sustainable and long lasting inclusive growth as well as the development of the country”. The 2016-2020 NMNP comprises seven strategic axes: (i) the promotion of good nutrition practices and preventive measures; (ii) promotion of malnutrition management; (iii) the sustainable increase of the availability and access to nutritious and diverse food in area with strong malnutrition prevails; (iv) the reinforcement of food safety; (v) increase resilience to food and nutrition crises; (vi) improve hygiene and access to clean water and sanitation in areas of high malnutrition and; (vii) strengthening governance in terms of nutrition. The implementation of this plan will enable nutrition scaling up interventions, specific and sensitive toward the most vulnerable people with the implication of many sectors such as health, agriculture, animal resources and fisheries, education, social care, water, hygiene and sanitation. Côte d’Ivoire calls upon the International Community to support its efforts when it comes to the implementation of this plan. Indeed, the help of the United Nations, of the World Bank and the African Development Bank, the Government organises under the presidency of HEM Daniel Kablan DUNCAN, Prime Minister, Minister of the Economy, Finance and Budget, a round table for the funding of the 2016-2020 NMNP. The round table will be held on September 15 and 16. 2016 in Abidjan Côte d’Ivoire.